You can recover from addiction, the disease that feeds on your need to use alcohol, drugs, or other pleasure sources to self-medicate and self-destruct. Addiction is the manifestation of an in­ner beast -- the part of us that says "You're stupid," "Your parents don't want you," or "You will never fit in." We all have that beast inside us, and some of us believe we cannot cope with that dark, negative part of ourselves without succumbing to the seduction of drugs or alcohol. If you or someone you love is suffering from addiction, do not despair: there is a way to find health, peace, and fulfillment. Sobriety is not about becoming spiritual and dull. It's about living life with all your senses, embracing the parts of you that are offbeat, and taking control of the real world where you are loved and appreciated. 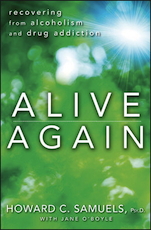 In Alive Again, renowned recovery expert Howard C. Samuels, who has been clean and sober since 1984, reveals how he learned to follow the 12-step path to a happy and productive life. He provides hope, inspiration, and prescriptive advice for how you or your loved one can recover too. He introduces The Hills Treatment Center's Program for Recovery and guides you through the process. Along the way, he reveals the dramatic story of his own addiction and repeated bottoming out among the rich and famous in New York and Washington, D.C. Drawing on his experiences as an addict, therapist, and counselor, Dr. Samuels gives you step-by-step guidance in finding help. He explains why many addicts and alcoholics behave the way they do, reveals the root causes of addiction, and helps you take the first steps toward recovery. You'll find out how the 12 steps of recovery work and how The Hills Program for Recovery works with them. You'll learn how to confront your demons, get rid of the shame and guilt that feed the disease, and find the strength you need in a support group. You'll also discover how to know when you're drifting toward a secondary addiction -- and what to do about it. For family members, Dr. Samuels offers guidance in the right and wrong ways to intervene, and discusses ways in which the addict's recovery can bring healing to the whole family. He also offers caring advice for parents of young addicts. The purpose of recovery is to finally live a life you can love. Dr. Samuels shows you the surprising ways in which you can help yourself by being of service to others and being grateful for the life you have. These and other steps will help you find your authentic self and identify your true passions. Don't let your demons continue to ruin your life. Read Alive Again and put yourself on the road to recovery today.